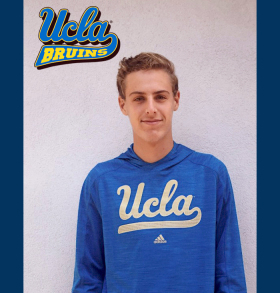 Class of 2019 recruit Alex Knight has committed to the UCLA men’s volleyball program. A 6’6″ outside hitter, Knight will join the team for the 2019-2020 school year that includes the 2020 winter/spring season. Both of Knight’s parents are Bruins alumni while his older sister is currently a junior at UCLA. A junior at Pacifica Christian High School in California, Knight is part of a team that is currently 5-4 on the season. He plays both outside hitter and middle blocker, though at 6’6″ he likely slides into an outside pin role once he arrives in Westwood to be one of the tallest OHs instead of being what would be the Bruins shortest middles. UCLA is in the midst of a 24-7 season in which they went 9-3 in the MPSF, finishing second and making the NCAA Tournament with an at-large berth. They have six players who can move to outside hitter, with three strictly outsides on their roster. Of that group, two are seniors and another a junior – all set to graduate prior to Knight’s arrival for the 2020 season.